The caption reads 'What do you think Odin looks like?'. Illustration by Kim Larsen as a child. Interview conducted by Joseph S. Hopkins over the course of July and August 2016. A burly Thor, ready to rumble and strongly influenced by Peter Madsen's Valhalla comic depiction, a series extremely popular in Denmark. 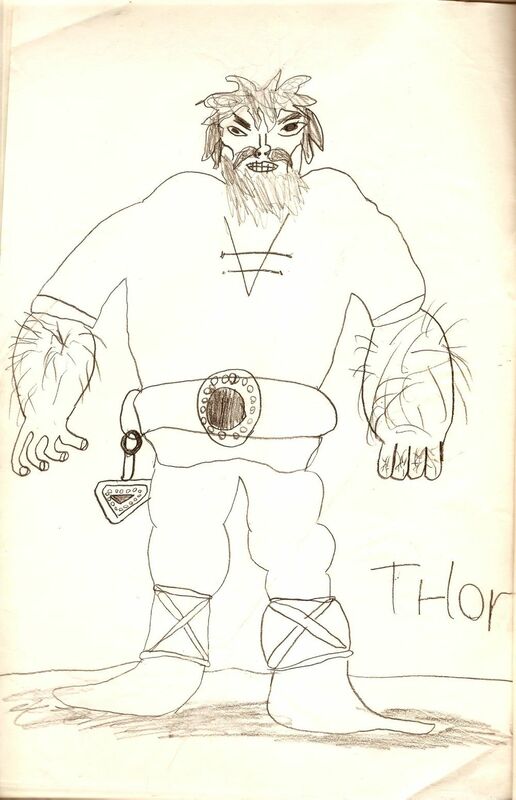 Illustration by Kim Larsen as a child. I grew up in Amager, Copenhagen, Denmark. 2. Can you remember when you first encountered Norse mythology or, more generally, Germanic mythology? And what was the context? My first encounter with Norse mythology, as far as I remember, was in school. I remember being read stories from Norse mythology in class. I have included a couple of drawings that I did for a school assignment of Odin and Thor. Not sure what class this was as the other pages in the book are about trees and animals, which would suggest biology class or something. The first encounter of Norse mythology could possibly also have been via the Danish comic book series Valhalla. The first book came out in 1979 and seems the first book has also been used as education material in schools. I don't recall that though. It was also done as a cartoon movie in '86. 3. How would you describe your religious beliefs (or lack thereof)? Guess I would consider myself agnostic. And lean towards that we are floating in a black starfilled sea of empty, meaningless, godless space toward the inevitable end for all of us. But I'd love to be proven otherwise. Anyhoo, I do love meaningful coincidences. Like seeing the shape of an algiz rune or swastikas in a building or logo or whatever. Also after using the algiz rune for years and finding out I could combine my name Kim in the algiz, using the Danish Younger Futhark. Insignificant to others I guess. 4. How would you describe your political beliefs (or lack thereof)? I tire very quickly about politics. I do vote at elections. And when I do I vote to the left. Not going to expand on this subject. I can already feel a nosebleed coming along as I write this, haha. 5. Do you have a formal academic background in Germanic studies? If not, where do you do your research on the topic? No. I haven't had any background in Germanic/Norse studies. I don't read as much as I used to about the runes, etc. But back in the day I found information about runestones for instance at the university library in Copenhagen. I also purchased books by Edred Thorsson [pen name of Stephen Flowers], Ian Read's Runa journal, etc. 6. How does Norse mythology and/or general Germanic mythology influence your creative output? Not so much these days as it has in the past. Though I still use the runes in my artwork at times. The Danish caption reads 'What do you think Thor's three treasures look like?'. From top to bottom, they are 'the hammer Mjǫllnir', 'the belt Megingjǫrð', and 'iron gloves' (the Old Norse Járngreipr/Járnglófar). Illustration by Kim Larsen as a child. Joseph S. Hopkins would like to thank Kim Larsen for his participation.